What's a riff and melody amongst friends? Velvet Revolver members Slash, Duff McKagan and Matt Sorum can't decide who their new singer should be. But when it comes to plagiarism suits, they know exactly what to do: pay up. The band has reportedly settled a plagiarism case with Tony Newton, bassist with the UK band Voodoo Six. Newton alleged that Velvet Revolver stole the riff and melody of their song Dirty Little Thing from Newton's own Cyber Babe, a number he wrote for his previous band Dirty Deeds. 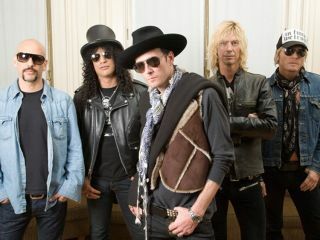 "A couple of years back, a mate of mine in LA called me to say he'd heard what he thought was my song on the radio, and that he had been a bit shocked when he realized it was Velvet Revolver," says Newton. "When I checked it out myself, I genuinely couldn't believe it, because it wasn't as if it was close…it was basically the same riff. I called my publishers to check whether they knew anything - which, of course, they didn't - and then basically left it with them. "I never really expected to hear any more about it and was as surprised as anyone when I heard that Universal had settled with Velvet Revolver." For Newton, it's a pretty sweet settlement: He will receive 20 percent of all royalties from the first Velvet Revolver album, Contraband, and the single dating back to 2004, plus all future royalties on the song from commercial uses, live performances, digital sales, etc. With this in mind, the staff of MusicRadar has a compilation of tunes it wishes to send Velvet Revolver. Who knows? There might be something on it they might like.